TORONTO, ON (Sept. 18, 2014) – Metal, music and some serious skateboarding moves inspired two new Scion cars for the upcoming Specialty Equipment Manufacturers Association (SEMA) Show. Scion will debut the “Scion x Slayer Mobile Amp tC” for heavy metal band Slayer and the “Scion x Riley Hawk Skate Tour xB” for pro skateboarder Riley Hawk at the SEMA Show in Las Vegas, Nov. 4-7, 2014. Frequently cited for its deep influence on other metal bands, Slayer has a look, sound and approach all its own. The band’s aggressive style carries into the tC sports coupe’s exterior look and band-inspired details. Inside, the vehicle has been transformed into a multimedia machine with amps, towers of speakers, a custom mixer and a 32-inch monitor for media playback. Mike Vu of MV DESIGNZ is leading the build process. Beyond his skateboarding career, Hawk is a rock ‘n’ roll aficionado with an appreciation for 70s style. 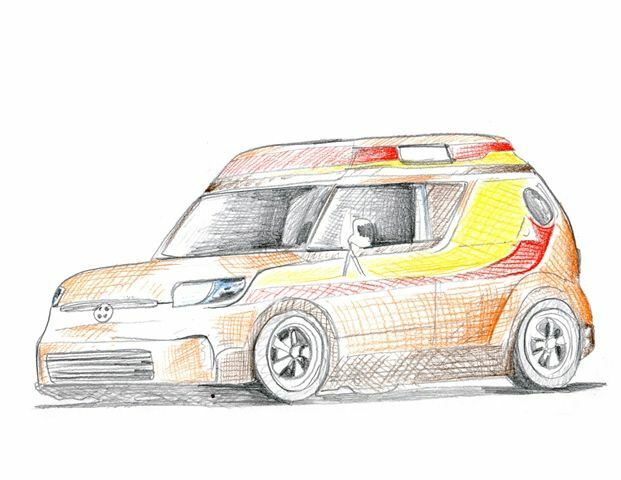 His xB ride combines those three passions through its high-end sound system, space for skateboards and classic orange and yellow striped paint job. Details like bubble windows, interior wood grain paneling, an 8-track player and requisite shag carpet make it a rolling, retro hangout spot. The build is being led by Scott Kanemura of KMA Productions. Both project vehicles will join a diverse collection of modified Scions at SEMA, including three FR-S sport coupes designed by media partners as part of the 10th annual Scion Tuner Challenge. While the SEMA Show is not open to the public, there will be opportunities to see the Slayer tC and Skate Tour xB at Scion events later in the year. Scion is the exclusive Canadian distributor of Scion tC, xB, xD, iQ and FR-S vehicles through a sales and service network of 90 dealerships across Canada. All Scions come fully loaded with many standard features including Scion’s Star Safety System. Backed by Toyota, Scion is built by passion and dedicated to quality, style and performance. Find out what moves you at www.scion.ca or www.facebook.com/scioncanada.